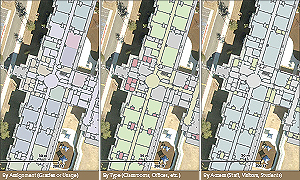 ArcGIS software-based solution provides easy-to-use interface to building information. Using GIS to organize drawings allows staff to find information they need quickly. Thematic mapping of space usage allows better management. Beaufort County School District is located south of Charleston, South Carolina, and serves all students within the county, an area that encompasses over 900 square miles, of which a third is water. The beautiful scenery, with many islands, draws visitors to the area and has fueled growth. According to the 2010 Census, one area of the county had grown more than 800 percent over the prior decade. Links to building files and documents are found on the Building Information window. This growth, combined with educational system changes in the early 2000s, led to a pent-up demand for facility improvements and additional space. At one point, one school had more children in mobile classrooms than in permanent buildings. Before this extreme growth, the district didn't have an in-house facilities department, instead relying on outside contractors. A bond referendum for a new elementary and middle school passed in 2006, and by 2007, the district hired an experienced in-house construction manager and planning staff. By 2008, when an additional referendum to build more schools was passed, the district had created its own Facilities Planning and Construction (FPC) Department. By 2010, the district built two early childhood centers, two elementary schools, a middle school, and a high school, and the facilities department was able to change focus from building schools to managing them. The FPC team needed a solution to help manage and maintain the facilities it had while simultaneously preparing for more growth. Carol Crutchfield, the district's school planner, had used GIS before for student assignment and attendance planning, but the rest of her team had limited experience with the technology. "We needed something that has a simple interface and could be accessed from anywhere so we can be out in the field and perform our normal tasks, including quick sketches and measurements," says Crutchfield. Over the previous five years, the building portfolio had grown by 33 percent, including new buildings and several building additions. The district had also added cameras; secured entrances; integrated whiteboards; higher-efficiency heating, ventilation, and air conditioning systems; motion sensors; occupancy sensors; wireless networks; emergency response software; and a networked automated building controls system. A transformation had begun with a growing level of technology integrated into the overall building operation. The FPC team approached the district's Board of Education, which supported the goal to find a solution to house facility information in one networked location. After inquiring through multiple sources, it found PenBay Solutions, an Esri Gold-Tier Partner based in Brunswick, Maine. To allow collaboration and system development outside the district's own network, PenBay created a solution that is hosted securely in the Amazon cloud and helped Crutchfield negotiate an educational license agreement with Esri that would serve its needs. 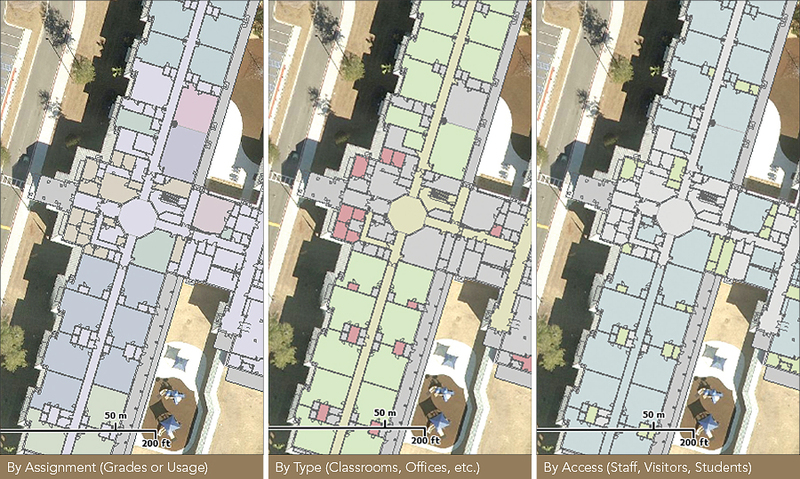 Thematic mapping allows the user to "see" rooms in different ways. The solution PenBay provided was its facilities GIS application, InVision FM, based on the ArcGIS platform. The solution allows district staff to consolidate facilities data into a single platform where it can be more easily accessible to planning coordinators, construction managers, security officers, principals, and even teachers. The solution is user-friendly—allowing staff members to access maps of each school by selecting a bookmark in the interface. The previous workflow consisted of searching through a room stuffed with rolled-up floor plans. The process of developing the district's InVision FM solution required the FPC to think logically about data needs, storage, and use. It also helped strengthen existing interdepartmental dynamics and the overall relationship with local government partners regarding data needs and data sharing. Now, the most accurate information is available at the touch of a button. 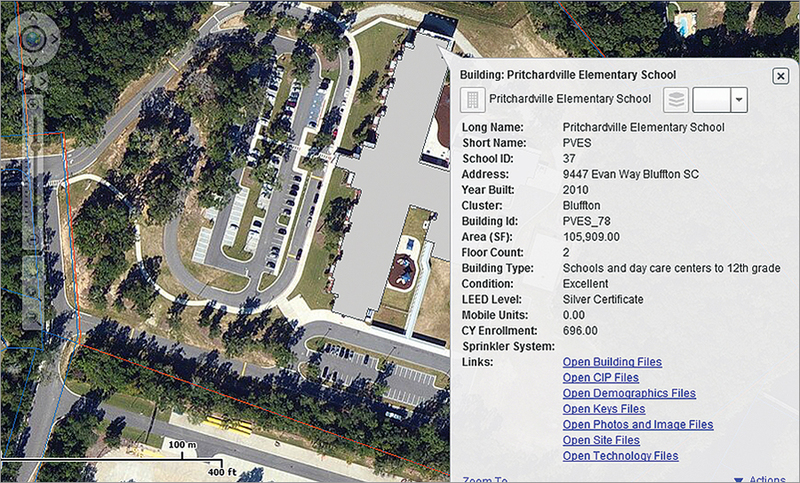 School footprints are layered on top of aerial imagery provided by the county. Parcel tax information is also available so users can easily pull up property ownership information. The district's Protective Services officer is now using InVision FM for managing many different situations, ranging from excess traffic at a downtown school during drop-off and pickup times to more serious situations, including hurricanes, earthquakes, and school lockdowns. Since the district's location is on an earthquake fault and in a coastal area that is always alert to the possibility of hurricanes, this solution provides a consolidated approach for viewing facilities to better protect the students and staff. To use the system, a staff member simply clicks a particular school's bookmark and the map zooms to that location. The user then clicks the building footprint to launch a pop-up window that has links to all the documents associated with the building, including design drawings, record drawings, CAD files, photographs, demographic information, equipment data, roof leak data, emergency evacuation plans, and construction closeout documents. This is important, as every structure, building, and renovation in the district has dozens of related files. "We've linked these documents so they can be easily accessed directly through the GIS; just click on the map and you are taken to where the documents live," says Crutchfield. "This is a significant time-saver, and saving time often equates to saving money." Viewing the building information with the new solution allows staff to thematically map the data and manage usage with GIS. Rooms can be color coded based on use, such as type (classroom, office), and whether spaces such as the gymnasium or auditorium are available for rent. The possibilities for use continue to grow. Currently under development is a workflow in which principals can use InVision FM to efficiently plan teacher assignments and the locations of classroom groupings to keep grade or curriculum teams together. Recently, the district used the solution to brief a contractor that had just won the grounds maintenance contract with the county. Instead of driving to each of the 34 buildings, staff members were able, with the system, to show the contractor where each school needed grass to be cut, contract boundaries, and what areas needed special attention. 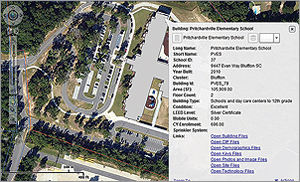 District staff quickly realized that GIS could not only serve to help maintain space at facilities but that it was also an excellent educational tool. And since one of the school district's strategic goals is to help students cultivate real-world technical skills and the district has an Esri educational site license, the district plans to offer GIS as a pilot course at one high school this fall using a state-level defined GIS curriculum. For more information, contact Carol Crutchfield, planning coordinator, Beaufort County School District (tel. : 843-322-0716), or David Brooks, project manager, PenBay Solutions.